Being that we're in the beginning stage of the Information Age, we are witnessing a shift of sorts where increased levelz of new and old knowledge of our past are being rediscovered. This age, also known as the Computer Age or Digital Age, is a period in human history where there's a massive change allowing individualz to have instant access to intelligence that would have been difficult to acquire previously. In a sense, our ADB (Ancestral Data Banks, or the metaphysical/spiritual connect we have with our Ancestorz where counsel is bestowed) beckonz for us to go back and fetch (Sankofa) our story so that we may awaken from this multi-millennium slumber. As we wake up, we are recalling ancestral customz, remembering tribal symbolz, and recognizing the cryptic meaning of ancient relics. With that said, so shall we begin reminiscing the word and soundz of our original names thought to be lost by the handz of our historical foes who purposely renamed practically everything! I will address a few termz we are familiar with, but may not fully be aware of, and not only the purposely misdirected definition of these wordz, but the true Afrikan term it originally was. For example, most are familiar with the term 'Egypt'. And while many are learning it's indigenous inhabitants were dark-melanted Afrikanz, there are still more who are not aware of its original name: 'Kemet' or 'KMT' (vowelz weren't used back then. And also note this english alphabet wasn't used either). Another word most recognize is 'Pyramid'. But when you look up what this word meanz, we see it translates to mean, "little flat cake"?! Is not something flat oxymoronic to something that has a triangular base and sloping sides?! One of the oldest names is 'Mir' and when speaking of more than one, the word is 'Mirw' (the "w" serves as the plural "'s"). 'Hieroglyphs' is another incorrect and foreign term used to describe the written language of our Ancestorz. The correct name is 'Medu Neter' (or Mdu Ntr). One of the most disrespected termz used is the 'Sphinx'. I addressed a comparison in the piece, 'Her Em Akhet v the Sphinx'. In summation, Sphinx has nothing at all to do with the correctly termed, 'Her Em Akhet', serving as probably the best evidence we have of the egregious attempt to erase the Afrikan connection by whitefolk. One last one is the 'Obelisk' who's original name is 'Tekhen'. Among other erroneous names, 'Cleopatra's Needle' standz out as the most ridiculous (please watch, 'Secret In the City' on DGTv Season 1). It gets even more crazy when we see the definition of Obelisk meanz, 'meat cleaver'! Thus we can see the extremes of the one's responsible for hiding our story in plain sight! So in honor of our Ancestorz, I will use the correct termz for the remainder of this piece. When we look at todayz society, much hasn't changed compared to ancient tymz. 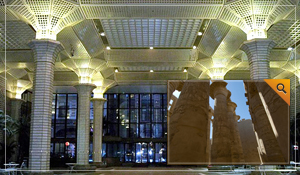 With the grand exception of the so-called "rulerz" being of the pale persuasion, for one who's aware of the history of ancient civilizationz (that were by no mistake Afrikan), you can still see remnants today in cities across the world... mainly in their structures. With works written by Tingba Apidta and Author/Historian Anthony Browder's book, "Egypt On the Potomac" and fieldtrip, we have a better understanding of the major and unheralded role Afrikanz played in the creation of both ancient civilizationz as well as the one we live in today. 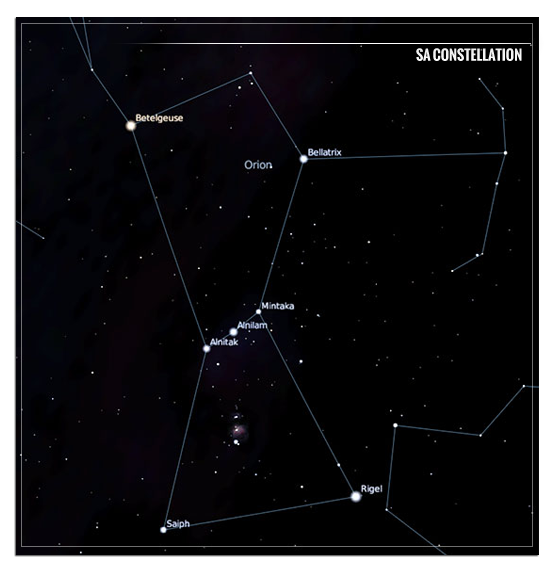 In the 'Her Em Akhet vs. the Sphinx' article, I touched on the level of awareness our Ancestorz had in Kemet with the constellationz and how Her Em Akhet and the Mirw were connected with the Sa (original name for Orion) constellation which includes Sa's belt. We also find the Dogon of Mali also serve as heirz to this knowledge.
? Otherz falsely celebrated while giving no credit to our Afrikan Ancestorz: Pythagoras (569-475BC), Aristotle (384-322BC), Hipparchus (190320BC), Ptolemy (85364AD), Galileo Gallilei (15643642), on up to Albert Einstein (18793955), and Edwin Hubble (18893953). Our Ancestorz mapped out the constellationz, planets, and moonz while whitefolk couldn't figure out how to make fire as they emulated the savage wildlife in the cold regionz of the northern hemisphere. Where (white) legend has it, Polaris (or the North Star) is believed to be the brightest star we can see, the Dogon knew the brightest star was of the Sa constellation. It is notably the most recognizable we can see in the heavenz. Along with Finch, Robert Bauval is probably todayz "first" to make the correlation between the belt starz of Sa and the three Mirw of Giza in his book, 'The Orion Mystery'. And when we look closer, we are witness to how our Ancestorz were able to literally bring heaven to earth through numerology. Said to be the one true universal language, numberz are seen all over the world; communicating to us in native tongues and codes beckoning our attention to decipher, if only we would tune-in, and there could be no better time than now to understand what December 21, 2012 meanz. In YTs world, they want you to fear the end of the world is here; that we'll be brought to extinction by some instant catastrophic event equalling the legendary belief as to how dinosaurz suddenly "disappeared". Fear has alwayz kept the ignorant oblivious to truth. It is this fear that allowz whitefolk to manipulate the mindz of many, simply because they choose not to think (which requires investigation, research, and applied logic) for themselves. Yes, December 21, 2012 is an ending of sorts, but to be taken literally show lack of awareness. We are making a shift in what's called 'the Precision of Equinoxes' where we are leaving the house of Pisces and into the house of Aquarius. "All things follow a pattern that leads to a greater end, which is but a beginning for another drama to be played. One such key is called the Great Year. The Egyptians employed it as a great celestial time table, predicting events long before they unfolded..."
In my video article, 'Numerical Mystereez', I pointed out one of the most phenomenal thingz that embraces numerology is the Great Year. Determined by the Precision of Equinoxes, the Great Year lines up with the 23.5° tilt of the Earth's axis. The time given for the Earth's axis to complete this cycle is 25,920 yearz: 2+5+9+2+0=18 » 1+8=9. Our Ancestorz of Kemet divided this astronomical event into 12 parts, each represented by a constellation symbolized by an animal. From these we derive the 12 signz of the zodiac, from the Greek word 'zoion', which meanz 'animal'. Now this is where it gets deep! The number 9 represents humanity and the end of cycles. To fully understand the use of numerology, lets go back to the oldest recorded civilization in possession of such knowledge... Ancient Kemet. There are many fascinated with Kemet, although most are not aware they were intelligent thinkerz and preserverz who just so happened to have dark-melanated skin, belonging to the Afrikan family. The Ankh and Eye of Ra are a few of symbolz seen around the world on jewelry, small statues, posterz, and even videogames, yet of these, I'd say a very small percentage are actual true students of this civilization. To identify Kemetic iconz in thingz and places placed right before our eyes, it is as Ayi Kwei Armah said, "study and practice" is the way you can truly tap in, which enables one to reconnect our Afrikan roots leading to elevated comprehension. Here is where we begin to see with our third-eye. Mind you, it wasn't until 1714 that the British government established the Board of Longitude creating longitude and latitude readingz, proving our Ancestorz knew about the science of mathematics many millennium before! Looking deeper into the Sa constellation, Bauval, in his book, 'The Pyramids and the Stars Decoded', showed the galactic link with the Mirw at Giza. Inside these resurrection chamberz, on the wallz you'll see Mdu Ntr written all over the wall speaking about the sky. Probably one of the most fundamental questionz about life one may have is, "where do we come from?" 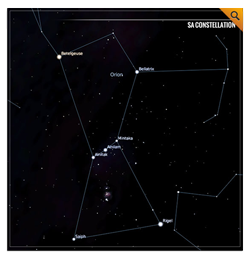 When we couple the philosophy of the Dogon, we see our Ancestorz pointing to this constellation for the answer. So when we speak of the popular, yet misunderstood phrase, 'Heaven on Earth', we see our Ancestorz did just that with the building of the three large Mirw (Khufu, Khafre, and Menkaure) and eight smaller ones. Simply overlaying the celestial body of Sa over the Mirw Plateau, you will see they match up! Probably millionz of light yearz apart, you will also see where the Sa constellation is the Milky Way Galaxy. The earth rendition has a 5-mile gap that separates the Mirw and the west bank of the Nile River... Heaven on Earth or better yet, the Djhuitic Principle: Correspondence (As above so below; so below, as above)! Note: Todayz Kemet is different from old. A part of ancient Kemetic life was the Nile inundation. As rainz fell during the spring in the Ethiopian highlandz the level of the Nile River rose above its banks, flooding the Nile Valley between June and October. This turned much of the valley into large lakes, but as the waterz receded, they left behind fertile silt from which new life would emerge. We've heard the phrase, "imitation is the highest form of flattery." I've alwayz believed replicating then erasing the original, never revealing it as the source, is the ultimate form of disrespect. Unless you know what to look for, you will not see just how much whitefolk have stolen from Afrika. Let's draw attention to a few American cities. What most may not know is that Sa is also a Nebula (where starz and planetary systemz are created from cloudz of gas and dust). Oftentymz we see this formation but overlook that there are three more starz not mentioned! When we look at it closely, just under the three somewhat horizontal starz (Sa's belt) we see 3 vertical smaller starz. "No male wears a sword between his legs, and very few hunters carry a sword. Perhaps a more appropriate description of that which is hanging down below Orion's waist is that of a phallus." Hearing the Sa Nebula has the stuff that generates starz above while representing the male productive system below is metaphysically a microcozm of the macrocozm or smaller part of a bigger thing. 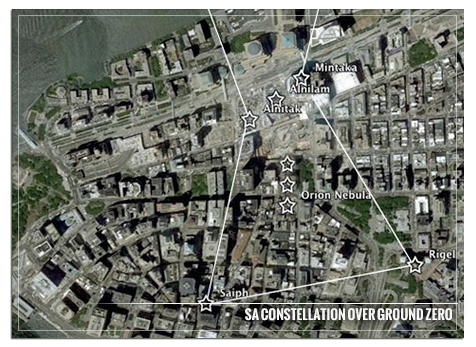 When you place this constellation over Ground Zero, we see Betelgeuse and Bellatrix is in the (Henry) Hudson River, Alnitak is the foundation of the South Tower, Alnilam is the foundation of�the North Tower, and Mintaka is the Freedom Tower, this is Sa's belt. The belt serves as a line of buildingz that include the Millenium Hilton, which is on 195 Broadway, and the Fulton Street Transit Center. The Millenium Hilton has 55 floorz and is located at 55 Church Street. Note the misspelling of the word 'Millennium'. Although the correctly spelled 'Millennium' translates to 1000 yearz, the latin-spelled 'Mille Nium' has an additional meaning: a thousand dominion (or control). Does this not translate to YTs aim of 10,000 (one thousand millennium)? Not far off the belief of the 6000 yearz we proposed in our 'IZ YT Human? or Mutant! series. The location of Saiph is between two buildingz, the American International Building (AIB) and 60 Wall Street. The AIB is currently the tallest building in lower Manhattan, having 66 floorz. Once completed, the Freedom Tower will surpass it and become America's tallest building. 60 Wall Street is the current American headquarterz of Deutsche Bank. This structure is the largest corporate building in the financial district, having�55 floorz. 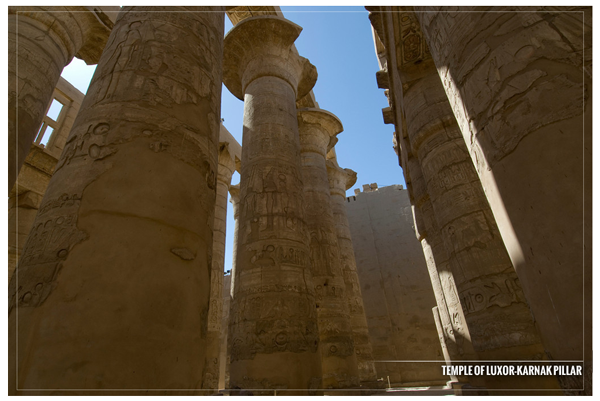 Notice the design of Hypostyle design of the entrance which come from the temple of Karnak in Kemet. The brightest star, Rigel is 66,000 tymz more powerful than our sun. Microcozmically, in New York City, Rigel is placed right over one of the largest government buildingz in the world, the Manhattan Municipal Building, located at 1 Centre Street. At the top of this building standz a gold-looking statue with european features whose name is the plagiarized greek version of Aset (wife of Ausar), Isis. Authorz Graham Hancock and Bauval noted in their book, 'Talisman', another statue of this imposter happenz to be the Statue of Liberty--which we find initially was designed as a freed Afrikan women by sculptors Eduord-Rene Lefebvre de Laboula and Frederic-Auguste Bartholdi. When we take a closer look, she wearz a crown with seven rayz pointing out. 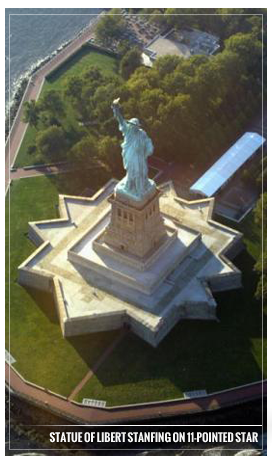 From an aerial view, you can see the base she standz on is an eleven-pointed star: 7, 11. We know from the 'Numerical Mystereez' video article, in numerology, the #7 is known as the 'Invisible Center' and is the spirit of everything. 7 is the numeric value for 'Heaven', the place where the dead are resurrected. The theory of there being a heaven can be traced again, back to our Afrikan Ancestorz of Kemet. 11 is considered a master number, representing refinement of idealz and revelation. It also symbolizes sin, transgression and danger. With 10 bein' the perfect number, 11 signifies the exceeding of perfection. 11, or 1+1=2, containz duality. It is also a master vybration and Numerologists purposely choose not to reduce this number to a single digit. Taking a further look at the relationship of 7 and 11 here, we find it is the equivalent height/base ratio of the great Mir (7:11)! In 1960 UNESCO (United Nations Educational, Scientific and Cultural Organization) put out an international call to save several ancient Kemetic temples that were going to be purposely flooded by the construction of the Aswan High Dam including the Temples of Dendur, Debod (given to Spain in 1968), Taffeh (given to the Netherlandz in 1971), and Ellesyia [given to Italy (year unknown)]. The question is "who" had the authority to give anything that isn't theirz away?! This is the nature of colonializm. What you don't hear is this being aboriginal land--meaning before the colonialists arrived--many of the people refused to leave their land and were thus drowned. UNESCO is a specialized agency of the United Nations. 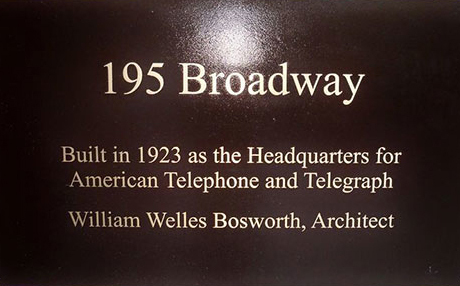 Located in New York on 1st Avenue and East 44th Street (1+4+4=9), we spoke of their logo before in 'Numerical Mystereez'. When you remove the continents, you will see a grid with 33 spaces. Outside of this masonic-laced grid, there are two 13-feathered wreathes. When you add both wreathes, the two stemz, and the 33 spaces in the grid, we get 61 (6+1=7). Again we see 7--the invisible center. Is this not the place diplomats from around the world come to conspire the continuation of global dominance? NOTE: You'll also notice the color of the logo being light blue. This symbolizes the first level of defense and is shared with freemasonz as well as the Boule'--who protects the hidden names of those who rule the world, cryptically drawn with the sphinx placing its paw over an urn. 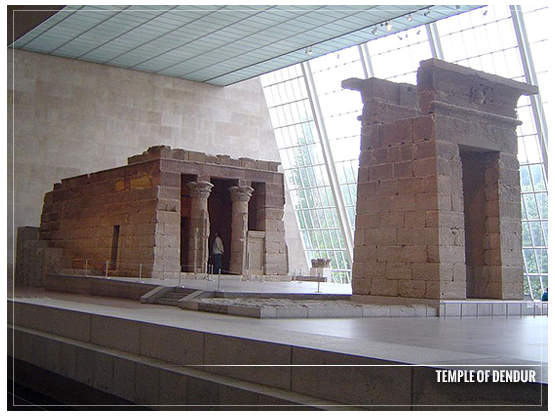 In my video article, 'Secret In the City', I spoke of the Temple of Dendur sitting today in Metropolitan Museum of Art, located at 1000 Fifth Avenue. Right across the street from the temple is an ancient relic, a Tekhen (also called an Obelisk, but erroneously called Cleopatra's Needle). The connection between Giza and Ground Zero is not exact in alignment, the Freedom Tower should be in the middle of West street. However the Mirw at Giza is basically a Ground Zero of sorts. It was the tallest structure in the world for more than 4000 yearz, serving as a marker of the original prime meridian, and�last surviving ancient wonder of the world, Kemet. As mentioned, the overlay of the Sa constellation showz the architects behind this are trying to bring Heaven to Earth just as our Ancestorz did in Kemet, only the parties involved are not for the benefit of humanity but rather tightening their already clenched grip on the masses intellect and will to know. *Some key names behind this design are Larry Silverstein, David Childs, Daniel Libeskind, Dan Tishman, and Douglas & Jody Durst. Could it be 9/11 was purposely done to rebuild the Freedom Towers? If you've read our 6-part series covering 9/11, you're aware of the cryptic numeric and wordplay surrounding the incredulous collapse of the World Trade Center. In it's place, just over a decade later, the Freedom Tower is scheduled to be completed on, of all dates, Dec 21, 2012; "Judgement Day" as so many have been indoctrinated to believe when the world will end--although as of this writing (December 18, 2012), it seemz they will not make the deadline (see live view here and here). We know (again from 'Numerical Mystereez'), 33 is also considered a magical number. Most notably known for it's use in Freemasonry, which can be attributed to Albert Pike, a General of the Confederate Army, a 33rd? Scottish Rite Mason, author of the book that exposed the Masonz, 'Morals and Dogma,' confessed believer in Lucifer and main founder of the Ku Klux Klan (KKK). By the way, it is not a coincidence he chose the acronym KKK because 'K' is the 11th letter and K, or 11x3 = 33! Not�including the mast, the height of the building is 1368 feet, the same exact height as WTC1 which was of course destroyed on 9/11. You'll also see 1368 breaks down to 9 (1+3+6+8=18 » 1+8=9). I must also point out the 104-floored Freedom Tower, now the tallest building in the United States at 1776 feet including its mast, was designed by 33 architects. 1776 is also a key number being that this country's "freedom" was enunciated July 4th, 1776; the date the Declaration of Independence was signed. From our studies on the Illuminati [aka New World Order, Skull&Bones, Brotherhood of Death, and the (Cecil)Rhodes/(Lord)Rothschilds secret society], we know this same year a few months before July 4th, this New World Order was launched on May 1st with the resurrection of the Illuminati in Ingolsadt (Upper Bavaria), Germany by Adam Weishaupt, this same day the Luciferian Conspiracy was signed in North American (months before there was a United States). "America's founding pirates were 18th century deists who were profoundly influenced by the philosophical ideologies of the secret societies in France, Germany and England." These men, who signed this pact with the devil, got together again two months later to sign the Declaration of Independence on July 4th. Well actually, only two signed (John Hancock and Thomas Jefferson) and the remaining 54 didn't sign until August 2nd (so July 4th actually is not 'independence day')! Of the 56 signerz, 50 were masonz. They decided to use masonic (and stolen Afrikan) symbolz on its currency and became the only nation to print on its money, "In God We Trust". This, of course, drawz attention to the creation of this nation's capital. I must point out my interest in the subliminal meaning behind the designz of cities was sparked by Jegna, Historian, and writer, Anthony Browder [pic12: Browder Tour.jpg]. Haven written and conducted field trips in Washington, DC, Browder's been able to do something no other historian has to date: reveal the Afrikan origin in the design and symbolizm used in the creation of America's Capital. From his ongoing laborious work, the world (and in particular, Afrikanz) can today see ourselves in the way the western hemisphere was mapped out and designed (with a major special thanks to Benjamin Banneker). 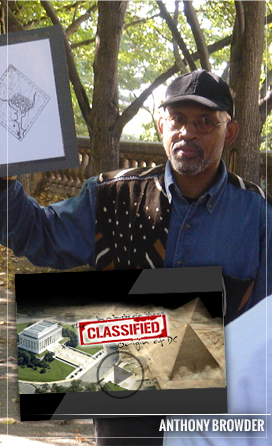 In tribute to Browder, Apidta, and all the Ancestorz here and abroad, known and unknown, in 2009 I released a video article on DGTv, 'The Classified Origin of DC' (Season 3). In order to this secret placed before us, we need to measure DC. Once measurements are made, you'll see what DC represents. But to overstand the measurements can only be done when you research the layout of our the Solar System, the Mayan calendar, and the Precision of Equinoxes. When we look at the Mayan calendar, like Ausar, they divided what they called the Sun Period into 13 equal parts of 394-396 yearz each. These periodz were called Baktuns in the Mayan long count. They believed that every 13 Baktuns, we on earth received a new Sun. The Sun Period had a length of 5,184 yearz. Coincidentally, the procession of the Sun through the houses of the Zodiac (which is really the view from earth around Polaris, the pole star) takes 25,920 years to complete. When you divide that amount by 5, you get 5,184 yearz. Do you notice the similarities between the Mayan long Count and the story of Auset? If you look at Washington DC, you will notice two triangles which make up a diamond, and atop that is a Star of David. I mentioned in 'Numerical Mystereez' the Star of David originated as a Kemetic symbol representing the union of Ausar and Aset originally called a Sephedet. When you measure from the middle of Lincoln Memorial to the Sephedet, you get 3.22 miles or just under 5.184 kilometerz--the same amount we find of the Sun Period! And when we look at the total layout of DC, it lines up perfectly EAST, where the Sun rises. 3.22 or 322 should be familiar if you've read my piece on Skull&Bones who has '322' under their logo. But the 3.22 mile measurement, or '322', is a covering. Because the Kemetic measurement was closer to the metric system, and Mirw and starz are involved, converting the mile to kilometerz, we get 5.184 kilometerz! As stated, 5184 yearz is the Sun period, so we see George Washington and the two men he hired, (Ellicott to survey the land and Pierre Charles L'Enfant to design the city) designed DC to be a solar calendar! The Washington monument is also a key being 555 feet tall and 55 feet wide. The key is the number 5. Now when you multiply 5x the whole length from the Lincoln Memorial to the top of the Sephedet you get 5x 5.184 kilometerz or 25,920--the same as the length of one complete cycle. 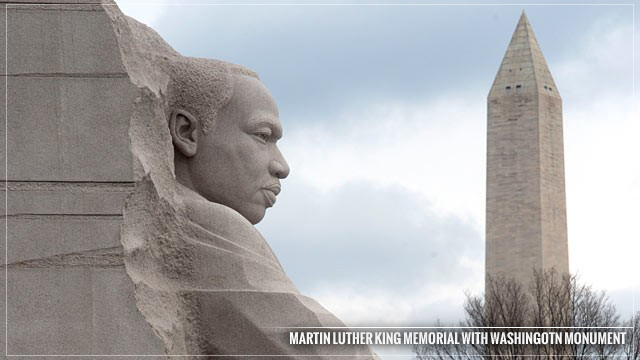 August 22, 2011, the 30-foot Martin Luther King Memorial was put on public display in West Potomac Park sitting between the Lincoln and Jefferson Memorial's and the National Mall. Aside from King's peculiar affiliation with the Boule', this monument is the first American-Afrikan to have a memorial on or near the National Mall and just the 4th non-President to have one--Benjamin Banneker's, however, sits in the secluded rear of L'Enfant Plaza, hidden from the more prominent sites everyone's more familiar with. But there's something strikingly similar when you look at King's monument. 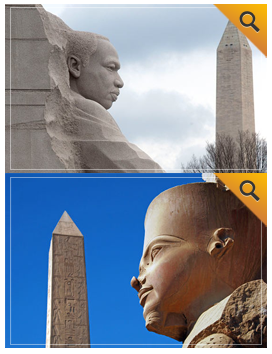 Whereas many have seen the Lincoln Memorial, but are unaware of it being an exact replica of Ramses statue at the Great Temple at Abu Simbel in Kemet, the same can be said for MLKs who's monument unmistakably resembles Karnak Temple's granite statue of Tutankhamun of the 18th Dynasty (1+8=9). We also see in the backdrop of each, a Tekhen. 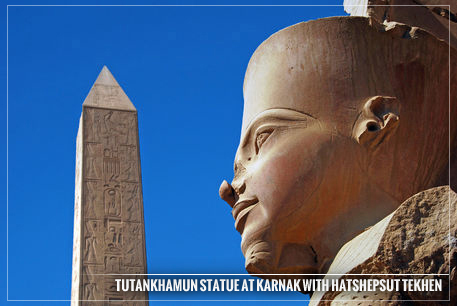 At Karnak, Tutankhamun standz alongside the last of the two remaining Tekhenw of Queen Hatshepsut (the 5th Pharaoh of the 18th Dynasty), which ironically is 30 meterz--or 98.4252 (9+8+4+2+5+2=30 » 3+0=3)--in height and 323 tonz, the largest standing Tekhen in Kemet. Note: Of the hundredz of Teckenw that once stood in Kemet, only 9 still stand, 10 more lay broken. The rest are buried or have been carried away to be shown off in exhibits that garnish millions--which of course, they keep for profit. Lastly, we take a look at NASA and the number 39 and how it takes on esoteric values when we find numerical mystereez have reached the National Aeronautics & Space Administration. Space Shuttle launches happen in Cape Canaveral, Florida. NASA--who consistently chose astronaut's that also happen to be masonz--takeoff from the Kennedy Space Center that has two launch padz and guess what they're numbered? 39a and 39b! Now ask yourself, Afrikan, why would they start the number at 39 and not 1? Second, why wouldn't the second launch pad be numbered 40 instead of 39b? It get's blatantly deeper when we find out the runway down to the launch padz is numbered 'Runway 33'! To understand the connection, we look at the name, 'Cape Canaveral'. It translates to mean the 'Cape of Reeds,' and it just so happenz the ancient Kemetic deity associated with reedz was none other than Ausar! Now what is NASAs main mission? To explore the universe or the heavenz--which is where Ausar resides!! One other note, 13 of the 39 signerz of the united states constitution were masonz. And it's not a coincidence that 13 tripled comes to 39! In closing, I emphasize retrieving Our-story requires further study and we have many giants who've started the conversation. I ask that you open your mind to the historical possibilities of the realization of whitefolk doing whatever they can historically do to delay Afrikan self-reliance and liberation to the point they've been able to convince negroes to emulate the cultural values of our oppressor rather than our true selves. "Sharpen your eyes and tune your ear so you'll know what you see understand what you hear." xxxxThe Classified Origin of D.C.